If you were hoping that Alpinestars was going to provide a few new additions to their already extremely well produced and versatile footwear collection, I have some great news for you. They have decided to offer some functional and classic stepped boots for both male and female riders by introducing the Oscar Twin Drystar and the Kerry WP Ladies Riding Shoes. The Alpinestars Oscar Twin Drystar Boots will fit seamlessly into the rest of the Alpinestars Oscar collection. This shoe offers the same vintage, classic look accompanied by all of the proper riding protection that you will need throughout your daily commute. It is constructed of faded & distressed full grain leather that is double and triple stitched throughout with a reinforced heel/toe box, and treated with Alpinestars own Drystar water protection. The main difference between this shoe and the rest of the Oscar collection is its stepped rubber outsole, which will undoubtedly help the rider lock into their footpeg and help provide that classic riding shoe look. 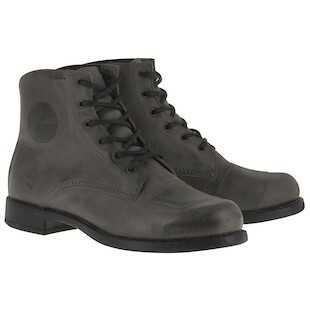 This shoe is offered in but one color (Grey), retails at $249, and will look great under your pants. Next up is the Alpinestars Stella Kerry WP Boots that has been specifically designed for women riders. Alpinestars did a nice job offering an entry level womens riding shoe that keeps a great, classic look while still offering protection and function. Since this shoe is ankle high, it will provide ankle cups to help provide further reinforcement. This shoe also comes equipped with a waterproof liner to offer an extra step of functionality. 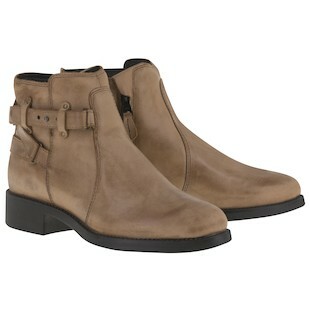 This shoe is offer in two colors (Black & Brown), retails at $199, and will fit about a half size large for most women. Both of these styles will fit like a traditional American riding shoe for their respective genders. So if your looking to give yourself an inconspicuous riding shoe that also provides some hidden protection and basic function for your everyday riding, look no further.